The United States has been portrayed as being more religious than would be expected based on income. 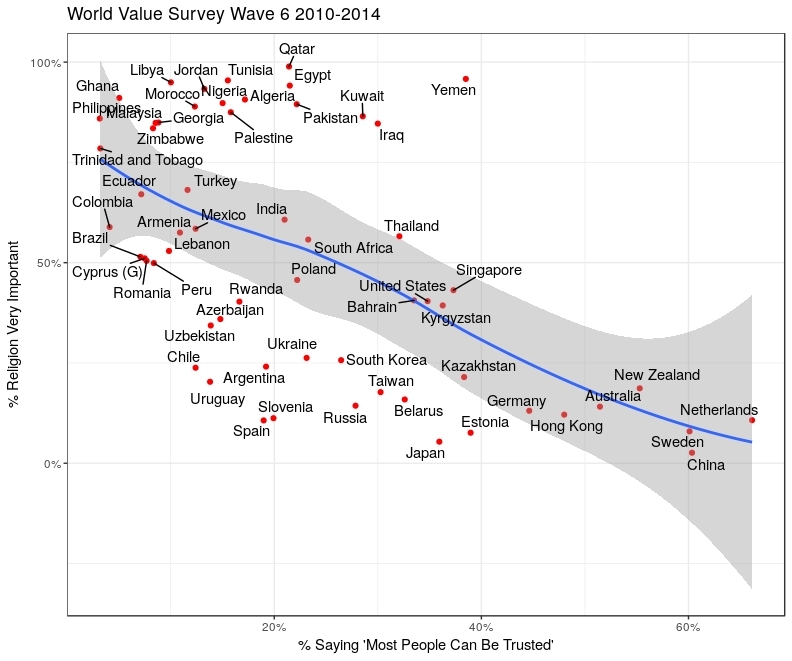 However, the level of a country's religious belief is better explained by its residents' level of trust of others. Country differences in religious importance are also related to whether religion is state-sponsored, and thus important to a citizen's economic and civil status. In addition to its correlation with religion, trust level appears to be helpful in understanding differences in income. 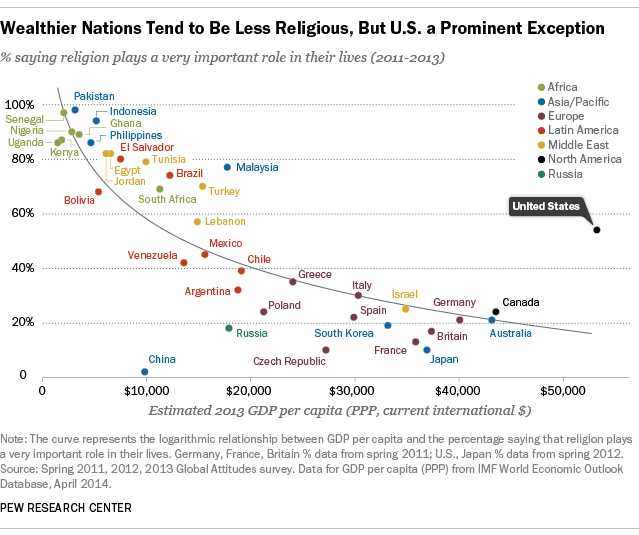 Figure 1 is a Pew Research Center graph showing the United States' unusually high "religious importance" relative to its GDP per capita. 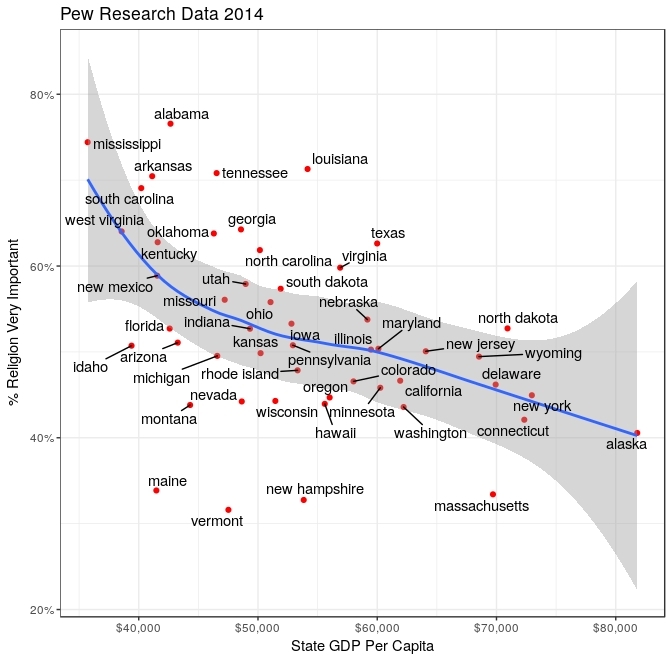 If one looks within the United States at variations in religious importance by State, there also appears to be a correlation between religion's importance and State GDP per capita. However this simple relationship is less evident in other global data sets. Like the Pew Research Center, the World Value Survey (WVS) also asks respondents around the world how important religion is to them. Their "Wave 6" data from 2010 - 2014 includes some other countries which also have "anomalously" high levels of religious importance relative to income like the US. However those countries were not included in Pew's Figure 1 above . Now the relationship between religious importance and country income no longer looks so straightforward. 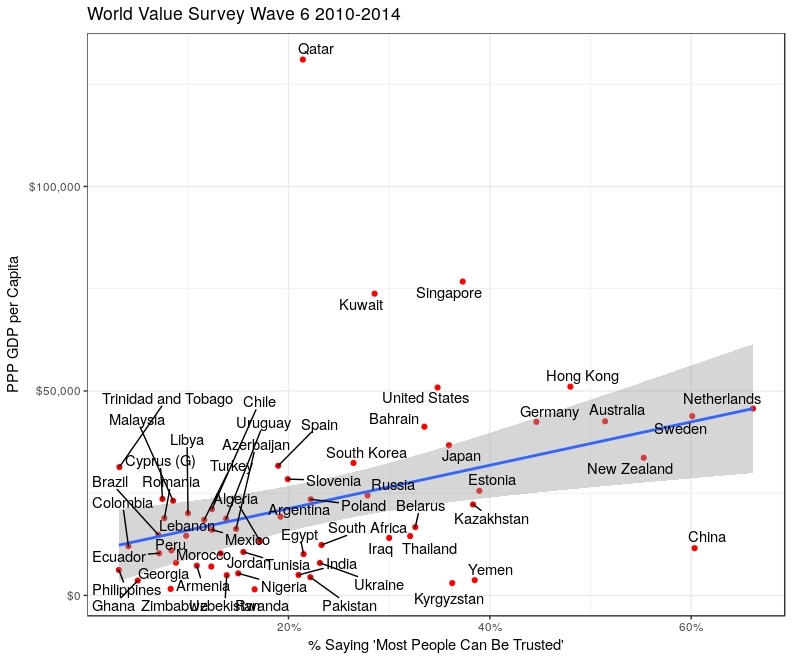 One of the questions in the WVS dataset relates to the amount of trust in a society. They ask: "Generally speaking, would you say that most people can be trusted or that you need to be very careful in dealing with people?" Figure 4 shows that religious importance has a stronger correlation with trust than it does with GDP per capita. Based on trust levels, the US (and Singapore) no longer appear "unusually" religious. A simple linear model indicates 32% of variations in religious importance among countries can be explained by trust levels (GDP per capita only explains 1% for this data set). We can "improve" the relationship if we include in our analysis the fact that some countries have "active" state religions. 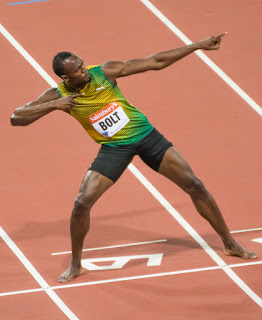 In some such countries it is a crime to be an atheist, attempting to convert citizens to a different religion may be illegal, and one's civil status and economic well being is determined in part by religious authorities. Not surprisingly in all of these countries, the percentage of those saying religion is "very important" to them exceeds 90%. 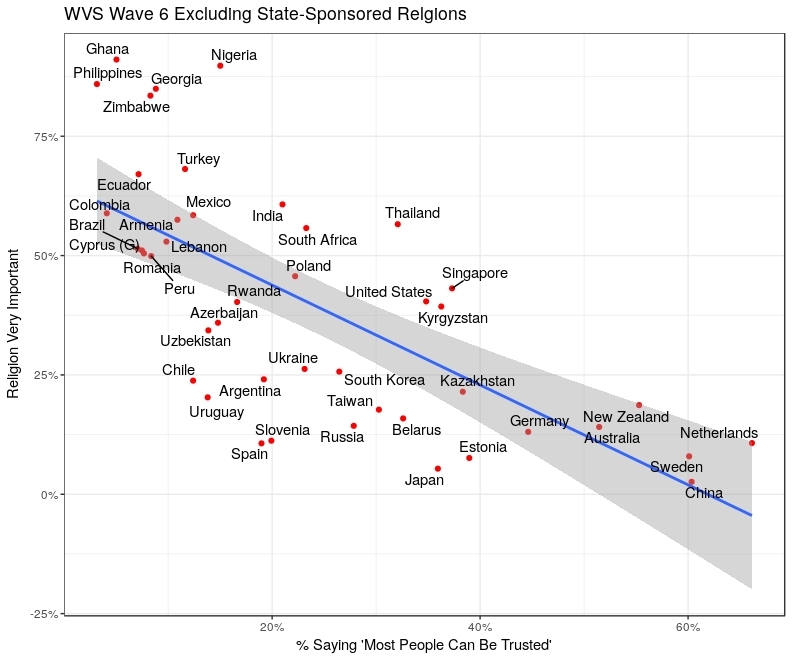 Figure 5 shows the relationship between trust and religious importance excluding countries with an active state-sponsored religion. For this reduced data set, trust explains 46% of the variation in religious importance (and adding GDP per capita does not improve the ability to explain differences in religious importance across countries). 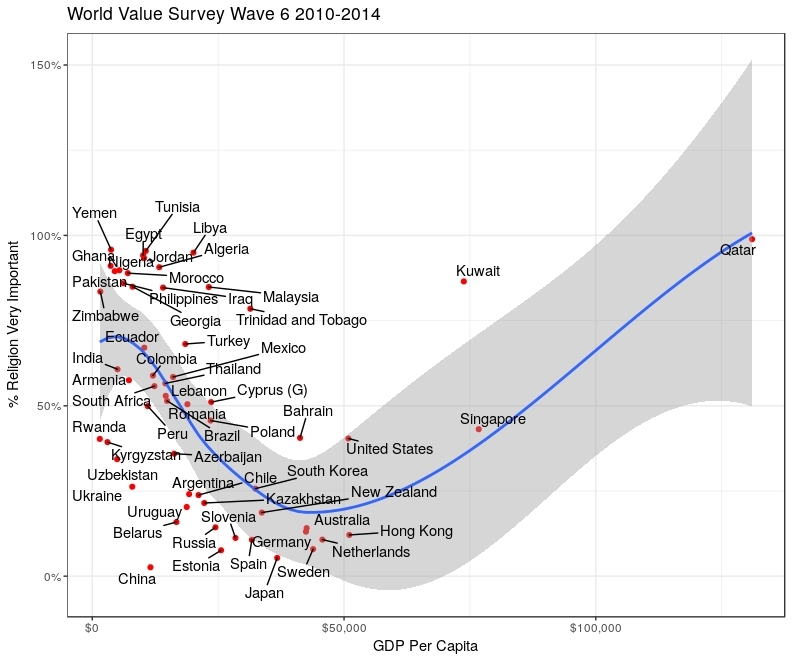 Interestingly, trust is correlated with country GDP per capita as shown in Figure 6. There is still quite a bit of variation, so clearly other variables (e.g. oil wealth for Kuwait and Qatar) are important in explaining country GDP/capita levels. 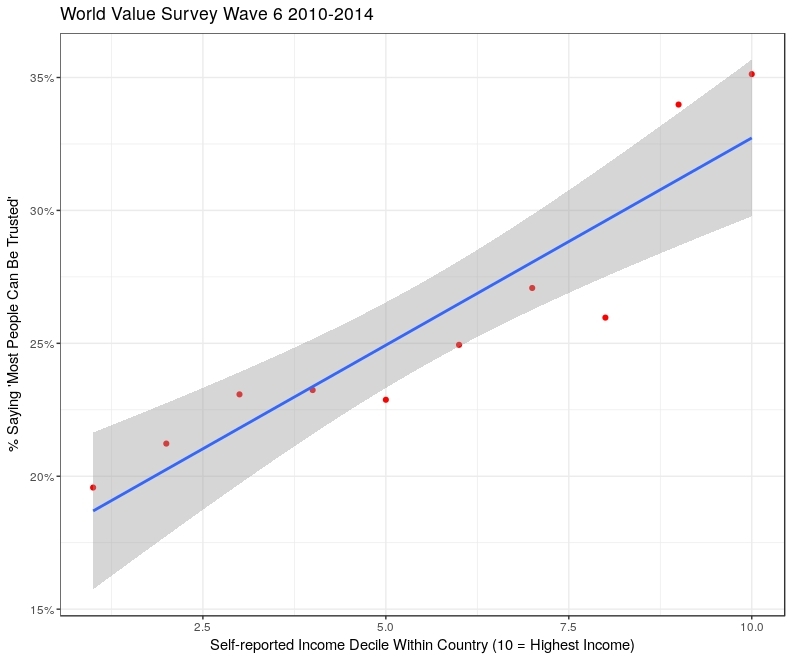 As shown in Figure 7, trust is also correlated with self-reported income decile within countries. That is, people who believe they in are in the top income decile in their country are also more likely to indicate they trust most people. Why are countries more religious if their citizens are more distrustful? In an earlier essay on the sharp socio-demographic differences between religions in the United States, I asserted that religious affiliation appears to also be a form of social networking. A religious community has economic value for its members because they are more likely to trust each other, support each other, practice good ethics, and shun/punish those who violate group norms. Quite simply, the value of belonging to a social network of this kind is greatest in an environment where overall trust in others is low. Why do countries and individuals with more trust have higher incomes? There has been much research on the relationship between trust and income at the individual and country level. Some analysts like Francis Fukuyama characterize countries where trust is low as ones which tend to be dominated by small family-owned businesses. This contrasts with high-trust countries that are more likely to form large corporations comprised of unrelated owners and workers. 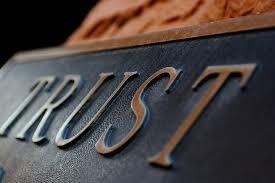 Higher levels of trust are also correlated with higher levels of education and entrepreneurship. Cesar Hidalgo in his book Why Information Grows maps country wealth to the complexity of the products a country produces. Highly complex products require networks of specialized companies comprised of educated workers with the critical knowledge and knowhow to produce them. Such linkages are difficult in environments of low trust. Transparent and reproducible: Figures 2 - 7 can be generated by using the free, publicly-available R program and the R code available in “religionGlobal.R” on github to analyze the publicly available data obtainable from the links in the article. Trust explains 53% of variations in the log of religious importance, suggesting the relationship between the two variables is exponential. Country education levels (measured as the percent of respondents with university degrees) and internet usage (measured as the percent who use the internet daily as an information source) do not have statistically significant relationships with religious importance when included with trust in a model.